Livejournal user gornev led me to a most excellent meme in his comment to my post about wooden NYC water tanks. 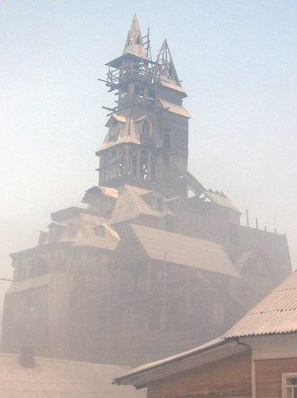 You see, there is this humongous wooden skyscraper in the Russian city of Archangelsk. I wanted to post about this since I saw the picture of that building (which became my desktop wallpaper), but it took some time to find more information and to find the time to write it up. The sources that I used provide somewhat conflicting information, but that’s mostly because the articles were written at different points during the construction. First you’ve got to see it. The links keep failing, but this google search will lead you to at least some articles with pictures. Nikolai also has a nice collection of old examples of wooden buildings in Archangelsk. So here’s what I was able to find out about the building and the builder. The builder and architect is Nikolai Sutyagin, an owner of a lumber yard and a small construction company. He was brought up by a single mother in a crappy communal flat. At 14 years old he was sent to a youth correctional facility for “hooliganism” (probably a fight). When he came back he started working as a construction worker to help support his mother and younger brother. Turned out that he was a pathological workaholic. His supervisor advised him to try his hand at “shabashing”. “Shabashing” was a free market anomaly in a planned socialistic society. Because of the shortage of productive workers in the land of fixed salaries jeopardized the completion of five year plans, collective farms and factories were allowed to hire freelancers and offer pay based on performance. This meant that a skilled workaholic such as Sutyagin could earn about 2000 rubles a month when a college educated engineer’s salary was 200 rubles. Teams of shabashniks were universally hated by collective farmers and factory workers (as well as all other salary men and women), but were tolerated. When Perestroyka came about Sutyagin used his money to start a lumber and construction business which brought him a substantial fortune. Now he needed a suitable residence. At first he planned on building a huge two story wooden house. Wooden structures are limited by law to two stories for fire safety reasons. At first he built a refrigerator sized wooden mock up. He liked the scale, but didn’t like the proportion of the roof. He decided to elongate it to achieve a more pleasing proportion. Then he started building working with his team like in the old times, but using the timber from his own company. When he was about done with the roof, he decided to build it up a little higher so that he could see the White Sea from the very top. Even though his building has two stories, the roof spans 11 more (some articles estimate the structure to have 12 stories, others – 13 and even 15). The government and his neighbors hated Sutyagin’s masterpiece. Fire hazard or not, it stands in the middle of a rather poor village, yet it’s higher than the tallest cement building in the city of Archangelsk itself. The city government ordered the structure to be torn down, but the order was never realized as far as I know. But Sutyagin was accused by one of his employees (who supposedly stole $30,000 from Sutyagin’s company) of beating him up and imprisoning him in a shed. True or not, Sutyagin got 4 years of prison. He was let out in 2 years. While he was away his company was looted like Baghdad after the war. Now he and his wife and daughter live in the unfinished skyscraper that he built. Now, here are some of my thoughts. I am deeply disgusted by the messages on Russian bulletin boards. There are three most common attitudes there: mocking the unfinished structure as a glorified barn, lamenting about the “mysterious Russian Soul” and gloating about the fact that the builder was sent to jail presuming that the source of the money used to build the skyscraper is stealing. Most of the press coverage concentrates on the eccentricity of the builder rather than his genius, strength of will and work ethic. Sutyagin’s skyscraper takes up a very special place in my heart, right next to the AIG building, the Flatiron (Fuller Building) and all my favorite skyscrapers, remaining, gone and those that were destined never to be built. I’ve used a number of articles as sources, but they all went offline. You can use this google search to find new ones though.